Visit any amusement center and along with the arcade games, the skee ball machines, and air hockey you are sure to find the timed basketball hoops. If you're not familiar with these allow me to recap. 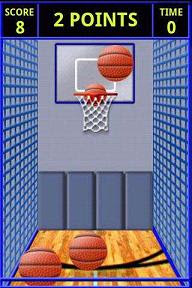 These arcade machines give you a time limit to shoot as many baskets as you can. Furthermore, they may mix thing up a bit by moving the basket to make things more difficult while awarding more points for each successful basket. Mini Shot Basketball brings all of the thrill of these arcade basketball machines to your Android device... not! Visit the developer's website if you'd like to learn absolutely nothing about this title. To my amazement, it's not even mentioned there. Figure that out. In any event my big problem with this game, and it's not a problem with the developers, is how are you going to simulate a two handed throw in a 3 dimensional space on a 2 dimensional device with a finger flick. You're not... that's how. And that's it in a nutshell. Once you figure out the right gesture its basket after basket. No real challenge. Even when the basket moves back to increase the distance of your shots it just requires a minor adjustment of a longer vertical gesture line to continue with amazing success. Sometimes I wonder how someone thought this would make a good computer game. Perhaps they saw how well the officially licensed Skee Ball is doing on the iPhone/iPod Touch platform. Having tried that, yes, my same criticism works for that game as well, yet they are making lots of cash from their highly ranked game. I played it a handful of times and that game got boring real fast, too. I've been looking for clones of some of my favorite arcade games. One such game is Centipede and doing a search on this title reveals just one similar game called Kilopod from Polyclef Software. 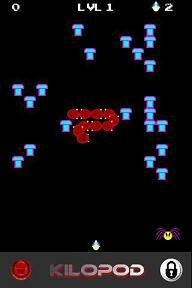 For those unfamiliar with the Atari arcade classic called Centipede, essentially you're a bug sprayer (aka gun, laser ...etc) at the bottom of the screen moving back and for shooting the approaching centipede. If you shoot its middle section it breaks into multiple smaller centipedes until you've sprayed each piece and move on to the next level. Furthermore, spiders and such also roam the mushroom forest and are also targets. What makes this title different from most arcade shooters of its time is that you can move up and down the screen a bit and are not limited to the bottom row as in Space Invaders or Galaxian. Kilopod is a nice enough looking game and replicates the game's play... at least until you play it on the Droid. I'm assuming that with a trackball the game plays MUCH better, but for me on my Droid it was horrible. I then tried opening the keyboard and using the DPad (while still is portrait display mode) and my gun only moved what seemed to be a character at a time (versus smooth scrolling). I can only hope the lack of smooth movement is because I don't have a trackball on my device. So the bottom line is, if your Android device has a trackball and you like Centipede this may be a game worth checking out. If you have a device like the Droid that doesn't sport a trackball then stay away. The controls ruin the game. My goal for this site is more so to help commercial software developers get reviews and attention for their games... especially when such attention is justified, but there's so much free stuff for the Android that it just can't be ignored. For a start, there's Asteroids by Mark Mainwood. A remake of the classic Atari arcade game of the same name featuring the original vector graphics. The game plays pretty well with the DPad and keyboard on my Droid, but without it I doubt this game would be too enjoyable. I just don't see trackball control working too well. Next, we've got Colossal Cave Adventure, from EC Software Consulting, which is a remake of the old "Original Adventure" from the 70s. Pure text. Simple interpreter. Obviously you'll need to be comfortable with your keyboard, whether on screen or off screen, to play this with any satisfaction. Deflektor, from Jompe71, is a remake of the old C64/Amiga game where you're trying to use mirrors to bounce the laser beam from entry to exit. The screen doesn't stretch to fill up my Android's full screen, but otherwise (sound, graphics) it looks pretty well done ad has all 60 levels from the original. Frozen Bubble is a game from Pawel Aleksander Fedorynski and I'm a bit surprised this isn't being charged for given the quality. It's a Bust-A-Move style game where you're shooting bubbles. When three like colors are attached they explode and anything not attached to the top of the screen falls away as well. You're goal is to clear the screen of all the bubble. The touch screen controls are great and I see it's developed by a Google employee in Europe. Lumbricidae from Amoneron is an odd title where you're using the accelerometer on your Android device to control a worm and lead it through tunnels. Eating soil causes you to move more slowly. Drinking oil causes you to speed up. Oh, and you're being chased by the rising water table. It really wasn't my cup of tea, but it was free. Meteor for Motorola DROID is a game that I can't tell whether it's free or a demo. It's from Mobile Stream, but has a similar icon to Chillingo's Meteor game. Add to that the fact that my icon says it's a Lite version, yet I don't see a pay version and I remain confused. In any event, as it stands now it's an excellent and free Breakout or, more accurately, Arkanoid clone. SFCave has been reviewed before and is still a favorite that I play almost daily. Twisty, from Twisty Team, is a Z-machine interpreter which means it plays the old Infocom games as well as a myriad of newer games based around that system. It includes 3 sample games including the aforementioned Colossal Cave. 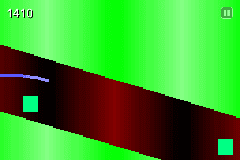 Colossal Cave seems to work fine, but the screen is messed up when I try the other two. I haven't tried any of the Infocom classics with this software yet, but am sure I will eventually. Who doesn't love Guitar Hero? The moment I first tried the game on a Playstation 2 made me fall in love with the game. One of my predictions back in the late 90s was that one area of major development for video games would be with the game controllers themselves and Guitar Hero was among the first home entertainment titles to justify that (now, if only I had worked for PC Gamer and could have documents that and other predictions). But... and there's always a but... Guitar Hero has been so successful that it's watered itself down. First, it's gone on to create Guitar Hero II, III, World Tour. And, of course, Rock Band was also spawned from this same game. And the Aerosmith version and countless other expansion disks. And most recently Band Hero. Lately, it has been pretty easy to pick some of these games up for a steal because they've made too many and our basements can only store so many plastic guitars. 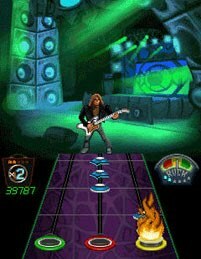 Enter the mobile version of Guitar Hero. Instead of strumming on a guitar replica I'm forced to quickly tap and hold on touch screen buttons. The music is great, but without the authentic guitar strum motion the game becomes a shell of itself. The mobile platform offers some great opportunities for innovation with touch screens, accelerometers, and haptic feedback. I'd really rather see games that try and take maximum advantage of what we've got instead of trying to cash in on a name. It's not that Guitar Hero World Tour is bad. The music is good. It plays reasonably smoothly. It has the options you might expect in a Guitar Hero World Tour game such as choosing an avatar or playing the drums (once again... what exactly is different here? I'm still tapping on the screen?). If you just absolutely have to have Guitar Hero in your pocket because you can't live for a minute away from your console version the perhaps this title is for you. I just think money would be better spent on a game that does something different, fits the mobile platform better, and takes full advantage of what Android devices offer. Automania was released to the Android Marketplace yesterday billing itself as the first path drawing game similar to Flight Control on the iPhone platform. Given that there are at least 3 other line/path drawing games including the recently reviewed Flying Aces that made me skeptical. But I'd really love to have a good one so I figured I'd give it a try and to my delight this game fills that need very well. In Automania flying cars are arriving at your hub and you have to guide them to the right garage based on color. Hold down on the car and draw a line over to the appropriate garage bay and then let the vehicle land on its own to score you points. As the game progresses congestion increases and that's when it gets interesting as you try and coordinate flight paths for groups of cars all at once. Making matters harder, the colors of the garages bays occasionally change although you do get a fair amount of warning. The controls for Automania are tight. I had zero problems with it detecting that I've chosen a car and drawing a line over to the bay. The cars are a bit on the tiny side on my Droid, but nothing terrible for a mobile platform where everything is already small. The music is good and the sounds, with cars beeping as they appear on the screen, fit the game. The game included three maps in an attempt to offer some game play variety. This is a very well done line drawing game and I'm thrilled to finally have a good one on my Android as I quest to replace the games I loved on my touch with Android equivalents. Flight Control, this game's mentor, has sold hundreds of thousands of copies on the iPhone (if not a million by now) and there's a reason. 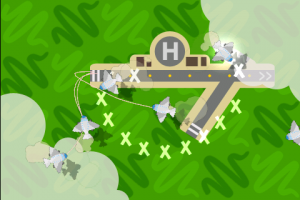 Once you start playing the game just teases your brain as you attempt to sequence the landing planes. It's almost like a 2D Root Beet Tapper. I'm sad to say that a demo version wasn't released alongside the full version as I think that could help drive some sales which, according to the marketplace, are still <50. This game deserves far more sales than that and all fans of this genre should get it. And if you're not a fan, get it anyways as another tribute to what your Android can do and to support developers that create truly great software. Simple, free, fun, and addictive. Four words to describe SunFlat game's SFCave. SFCave looks to be a game that's made the rounds on Palm, as a Java applet, ...etc and now on the Android. Simple. Simple because you're a ribbon streaming through a cave simply trying to make it as far into the cave as possible. Touch the screen to go up. If you're not touching the screen you go down. Don't hit anything or "Game Over". The longer you last the more points you accumulate. Free. Yep, doesn't cost a cent which fits all of you cheapo Android owners that are afraid to spend a buck or two on a game. Fun. The game plays so simply, but is quite challenging. And it offers an online scoreboard so you can see how well you are doing globally. Addictive. This isn't a game I play again and again and again. A session or two is enough for me. But then I'm back at it only hours later. Black Shark II: Siberia from HeroCraft is a side scroller that doesn't really do anything new, but is still quite enjoyable to play. 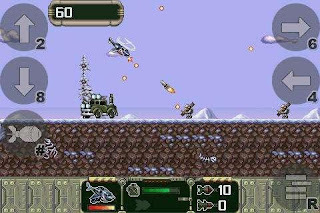 The screen automatically scrolls from left to right and you control moving your Black Shark II helicopter up, down, left, and right while destroying the enemy targets which consists of men, tanks, missiles ...etc. Firing is automatic and you can also drop bombs with a screen button press. In fact, I'd say Black Shark II really wouldn't stand out to me if it weren't for the under crowded gaming market for the Android. However, while this game and genre could certainly do better, Black Shark II has kept me coming back from more (and my review copies are not free... I'm buying all of these games based on their own merit and my money). I was first introduced to HeroCraft as they released a boatload of new demos to the Android Marketplace about two days ago. Apparently they've been making games for a lot of J2ME type devices for quite a while and thus the Android is an easy market for them to target. I tried some of their others titles and wasn't terribly impressed whether usually quitting from boredom or technical glitches, however, this title stood out. No graphical glitches, force feedback support, decent sound, and entertaining game play. One of the things that struck me about most, if not all, of the HeroCraft games is the arrangement of buttons on the left and right side of the screen. I know those are for use if you don't have a keyboard, but it would be nice to be able to turn those off if I'm not using the screen as my main control. On my Droid the helicopter controls make good use of the DPad for left, right, up, and down and the screen button for dropping a bomb works fine although it would be nice to be able to use a keyboard key for that. It may still be possible and I just haven't found how to configure that, but I've been through every option on the menu and it sure isn't intuitive. The game is divided into several levels and as you fly your copter it auto-fires. Flying left or right also tilts your chopper allowing you to fire up at the sky or down at ground targets, but you have to time it right given the lack of a fire button. Thankfully when it comes to dropping bombs there's a button for that. Bombs can be used to take out larger vehicles. As you fly and fire on enemy targets they're busy peppering you with fire and you'll have to avoid this or be shot down. After making it through a level you'll be able to buy add-ons for your chopper whether they be improved offensive or defensive capabilities. The graphics are decent as is the sound, and the game also features on on-line scoreboard. In my quest for good Android games this is currently my favorite side scrolling shooter. It offers solid control and enjoyable game play, but, as stated, doesn't really do anything special for the genre and I suspect that it'll be succeeded pretty quickly. In the meantime, it only costs about $3 and that's a bargain in the entertainment industry. 1) If it's a pay app then make sure you release a demo that lets people really try your software out. This means that not only do you need to release a demo, but also that you need to think about how you're going to let a prospect taste your software without giving so much away that they don't buy it if they like it. 2) Include screenshots in the marketplace... the more, the better. I want to see what your app looks like BEFORE I spend my time download and trying it. Besides, if you've put the effort in to make it look nice why not show that off? 3) Use the Android Marketplace. I know they want a cut of the profits and it would be cheaper just to put your demo there and sell your app on your own website, but buying through the marketplace instills confidence and provides convenience to the buyer. You'll make up for it in sales by being where everyone else is. 4) Update your app. Computer software is never truly done... it's evolving with new features, bug fixes ...etc. And every time you upload an update you become the 'head of the class' in terms of the "what's new" area. 5) Get good keywords in your descriptions. As I said in my review, I can't believe Speed Forge 3D doesn't show up for 'racing' and 'line drawing' didn't find Flying Aces. Poor keyword choices... and it doesn't have to be that way. It needs more and better categories. And a way to buy gift cards. One of my first iPod Touch purchases was a game called Flight Control, a game which Sticky Coding's Flying Aces clearly uses as a model. So much so that the main landing screen is identical in layout with its two runways and helicopter port. Flight Control is an OUTSTANDING game and was among the first types of games I searched for when I got my Droid. Flying Aces was one of the two games similar in nature that I found. In Flying Aces you are managing an airport. Jumbo Jets, Prop Planes, and Helicopters are all on the way in increasing numbers and it's your job to plot a path to the landing strip and safely land each plane before a collision occurs. Play is done simply by pointing at a plane on the touch screen and dragging to create a line to the proper runway (hence the genre being called 'line drawing' games). Jumbo Jets must land on the longest runway, Prop plans on the other (shorter) runway, and Helicopters must land on the helicopter pad with the big H stamped on it. While dragging a series of Xs are displayed on the screen as you continue to drag. These turn into lines once complete with a yellow line indicating a path that will land the plane and a white line just indicating where a plane is headed. As new planes arrive an off screen alert is displayed to assist in minimize uncontrollable accidents at the edge of the screen. Furthermore, there are also other objects to avoid or collect as additional points. Flying Aces has been regularaly updated and I'm pleased to see the game improve from something that was frustrating to play due to poor control to a very enjoyable game. One issue that still persists is that when I drag a path often the plane feels the need to do a U-turn first before following my path adding seconds to its landing time as I try to queue several planes up for landings. Finally, the graphics... despite all of the extra pixels on my Droid... feel blown up compared to the original Flight Control (i.e. the planes are bigger and puffier). That's not entirely a bad thing... if I'd never played Flight Control I wouldn't know the difference. Fortunately, the developer does offer a trial version that allows you to play the game for a short while and they also appear to update this app on a regular basis. I'm hopeful that one day the control will recognize the fact that I probably don't want the plane's first move to be a U-Turn. In the meantime the game offers and enjoyable alternative for Flight Control for Android owners. Abduction! World Attack is pretty clearly a Doodle Jump clone from the iPod Touch world of gaming. That's good news for me as that's one of the few games that I actually return to again and again with it never fully wearing out its welcome. Abduction!, however, has a better theme and deviates in its own way which is nice to see. In Abduction! aliens have abducted your herd and you, a lone cow, must rescue them by climbing err jumping high into the sky after their alien space ship. The play behind this game involves jumping up the screen by tilting your Android device back and forth so that you land on the various platforms of earth the aliens errantly dragged along for the ride. One thing that's really nice to see in this game is the climb past the trees, beyond the sun, ...etc. The cartoony graphics are nicely done even though our cow is a little on the boxy side. During the climb you'll find cows parachuting back to earth that you can rescue, gift boxes for bonus point, and bombs which are to be avoided. The game also offers an Adventure mode where you'll travel from location to location gathering a gold coin that you'll find in each place and along the way you'll encounter a host of other characters such as billy goats and lions. Finally, a kids mode is just what the doctor orders when playing with youngsters... having a 3 year old in the house made me very appreciating of this as I try to share the world of gaming with her. There's a demo available for this game called simply "Abduction!" which you can try for free, but this is a 5 star effort available for about $2.20 with lots of features and replayability. After having my Motorola Droid for about a week I must admit that I started to become disheartened as none of the games that I had found were really on par with what I was used to on my iPod Touch. The phone and the apps for news, stocks, sports ...etc were fine. But when it came to games, nothing seemed to touch (no pun intended) what I was used to. This is the game that changed that view and inspired this website. 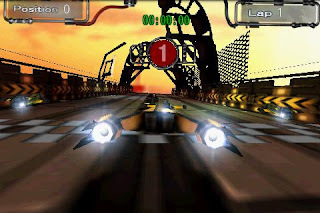 Speed Forge 3D, from Polish developer Rat Square, is a 3D arcade racing game with several futuristic vehicles to pilot around different race tracks. It takes full advantage of the accelerometer allowing you to control your ship by turning and twisting your Android device. Bump into a wall and it uses 'force feedback' to let you know. The graphics are as great as they are smooth... and I haven't really experienced any of the lag I've seen, presumably from background tasks kicking in, in other games. The premise is simple: be the first to finish the race. Scattered around the track are the usual powerups and such that have become common on todays racing games. Speed Forge 3D also allows for you to adjust how sensitive the accelerometer is for steering, if you want to tilt to accelerate (or have it manually do it for you), sound, and vibration. The game also offers 3 difficulty levels, 3 vehicles, and 6 tracks (although all but one vehicle and track start as locked waiting for you to prove that you are worth of them). The only glitch I noticed on my Motorola Droid was that when selecting a vehicle the right on-screen touch arrow didn't work. I have to assume that that's some calculation error due to my device's odd screen size. Touching slightly to the left of the right arrow triggered it and worked (I've seen this same thing in other games as well and this is a good tip to be aware of as a Motorola Droid owner trying to use games not specifically tested on the Droid). Another thing that puzzles me is that when I search the marketplace for 'Racing' this beauty of a game doesn't appear. I presume the developers just didn't add that as a keyword or something. Speed Forge 3D is available as a demo to try before you buy, but unless you hate racing games then this is one you'll want to have on your Android if only to show off to your friends. Buy it! Buy it now, and support outstanding game development on the Android platform. There's a game on the iPod Touch called Galcon and in a nutshell they've taken Risk and a) made it a battle between planets and b) made it 'real time'. It offers countless difficulty levels and options so that there's something for everyone. Archipelago clearly tries to emulate this on the Android. In Archipelago you battle for control of islands (instead of planets) [they're all just colored circles anyways] and each island has a strength. Send units of a higher strength to an opposing island and you'll conquer it. Conquered islands build units for you based on their physical size (larger islands make units faster). Take over all of the islands and victory is yours! One of the things Archipelago does right, and in my opinion every game should do, is offer a free demo in the App Store. How many great games are going to be passed by because I don't want to experiment and buy every game that makes its debut (although granted that's also the reason for this website)? In some cases, well recognized titles may be able to get by without a demo (i.e. Sims 3), but if I don't recognize it and can't try it for free then I'm probably not going to buy it. That said, Achipelado offers a free demo for all to try. I tried it and although basic (walking me through 3 simple missions and explaining the controls to me) it got the idea across that this is a game I'd probably like. I like Risk... I like real time strategy... and especially with the unlimited maps/replayability promised in the full version I figured I'd like this. But that's where disappointment sets in and suddenly I realized that what could have been (and could still be... here's hoping) a great game falls quite a bit short. The countless options present in my beloved GalCon aren't even close to being here. Every game is just a random map... no speed differences (and the planes move kind of slow between the islands)... no skill levels... no options such as not seeing how many troops are present on enemy island in advance. These all add up to the game getting real old, real fast. Here's hoping Second Gear Games isn't done with this one yet and will issue an update to add more game play options. After all, if there's one thing app developers have seen in the Apple's store it's that regular app updates increases exposure AND sale$. I've always been a Windows Pocket PC kind of guy. Still am I guess, but the holy wars of computing are long since over as I try (admittedly hard to do) to keep an open mind towards new platforms, new competitors, and new ideas. In the Spring I was looking forward to getting my next Pocket PC upgrade so I started shopping around. I had heard of the iPhone, but didn't really want AT&T as my network provider and didn't really want an Apple device in my pocket. I did, however, get an iPod touch and was blown away and admittedly late to the party. On November 6th I was one of the brave who stood in line through cold and rain to be among the first at a Verizon store to get a Droid (okay, I'm kidding... got it at Best Buy at 3 in the afternoon and they had plenty left). The hardware specs are comparable, but it has a DPad... the screen is gorgeous... it's an OPEN device (meaning I don't have to hack it to get around Apple's App Store)... and it's on Verizon's network which is good for coverage, but bad on the wallet. So here we are... checking out the apps... 10,000+ of them trying to find replacements for all those that I have so enjoyed on my iPod Touch. Are we there yet? No. But here's hoping I can make a difference by guiding you to those apps that truly deserve to be on your Android device.